All passports has to be valid for more than 6 months from the arrival date, the Israeli border police have the right to deny entry for any client who has less than six month validity passport even if he has got the visa, please make sure that all passports are valid for more than six months. 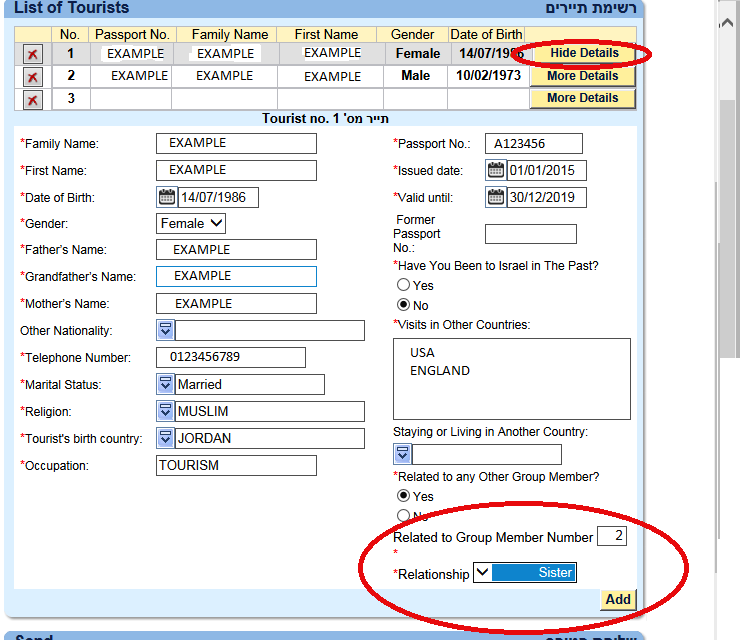 Please double click on the link below to check if you require a visa to enter Israel. Visa for Christians, needs to be submitted 10 working days prior to arrival date, excluding Fridays, Saturdays and Jewish holidays that shouldnt be counted. Visa for Christians Malaysian and Indonesian Nationality, needs to be submitted 30 working days prior to arrival date, excluding Fridays, Saturdays and Jewish holidays that shouldn't be counted. "The Ministry of Interior will not allow any amendment in the visa after being issued. For special cases only, the Ministry can amend visas if less than 10% of the visa is not correct, means that for a group of 10 pax, only 1 pax details can be. In case the visa has more than 10% mistakes, the visa has to be submitted again (if time permits) and to be paid for the second time"
You are kindly requested to check the visa and all the details before sending the manifest to avoid any problem with the Ministry of Interior. And to make sure that all the clients will be approved. For any application that has time frame of less than 10 working days, it will not be accepted by the ministry of interior and the application online will not allow the access to submit the visa. Christians usually require a moderate security check by the Israeli intelligence and the ministry of interior before issuing the visa. All the data submitted in the manifest has to be reviewed and corrected before submitting the application, any wrong information could result in the rejection of the visa partially or totally. All the requested data columns have to be filled as per the application online. In order to cross to Israel the client must use the passport that he/she submitted to the ministry of interior and not any other passport. As per the Ministry of Interior, for all nationalities including Malaysians and Indonesians, there is a minimum number of participants for the manifest is required, it is required to have minimum 5 names in order to submit the visa. Please consult with us. Collecting the visa from the ministry of interior totally depends on the ministry of interior personnel and their working schedule. We have no control on when visas can be collected, it could be one day before clients arrival or sometimes on the day of arrival. There are two kinds of visa rejection, the rejection because of national security and with this kind of rejection we cant submit an appeal to reconsider the rejection, the other kind is because of missing or wrong data. We dont guarantee that the appeal will be answered positively, the technical appeal will cost $35 per person prepaid. The answer by the ministry of interior for the appeal (rejection due to missing or wrong data) might take up to ten days. During high season, issuing the visa may take longer time than usual thats why it is always recommended to submit ahead of time. The ministry of interior has the right to deny visa to any client in the manifest or reject all the manifest without giving any justification. The Israeli border police & /or the Israeli Intelligence has the right to deny entry to any client / Group from entering Israel even if they have visas issued from Israeli ministry of interior. OS tours bare no responsibility and cant be held responsible by any means includes compensation or for any cancelation fees resulted if such cases took place. For any further information, please contact our O.S consultant. Visa for Muslims needs to be submitted 30 days before arrival. Muslims always need intensive security check by the Israeli intelligence and the ministry of interior before issuing the visa thats why its recommended to give all the correct and updated data of the clients to avoid any delay or rejection. For any application that has time frame of less than 30 days, the ministry of interior will not accept as the application will not be filled online. The answer by the ministry of interior for the appeal (rejection due to missing or wrong data) might take up to three weeks. 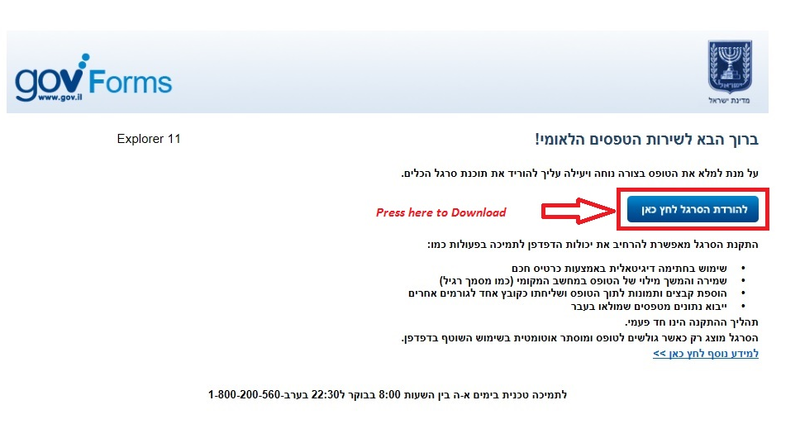 As per the Israeli Ministry of Interior new regulation, the group shouldn`t have cancelation of more than 20%. As per the visa regulation of the Israeli Ministry of Interior, all the group members must arrive and depart on the specified dates mentioned on the visa (unless otherwise approved by the Israeli Ministry of Interior in special cases) and any violation to this or delay in departure to all & or part of the group members will result in a payable penalty of $15,000 per group, and will result in black listing the agency abroad. Agents that want to issue a collective visa through the Israeli Ministry of Interior will by default accept to be fully responsible to the clients they issue the visa for. And accept to pay the $15000.- penalty should any of their clients stayed back illegally in Israel. 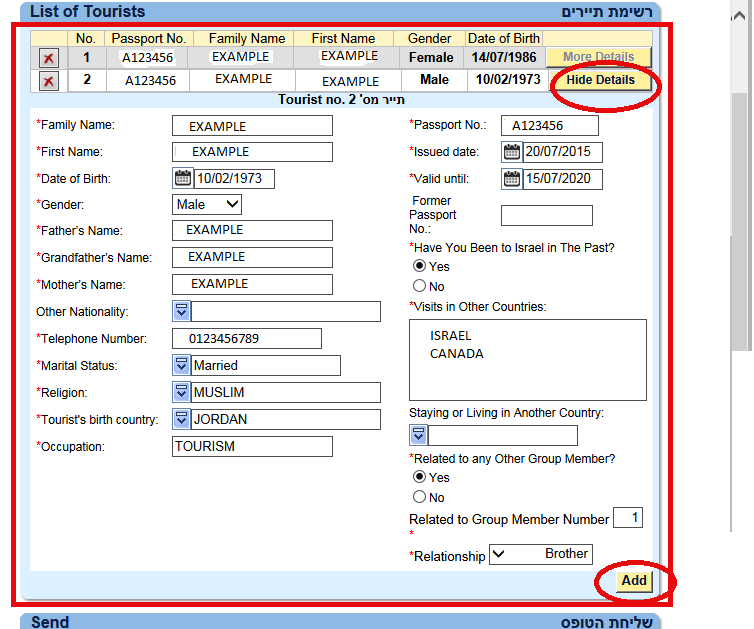 Agents that wants to use a collective visa through the Israeli Ministry of Interior should do their own check and take all guarantees from their clients to make sure that the latter are genuine clients and are not seeking to mis-use the visa granted to them by staying illegally in Israel and / or violating the rules of the country. 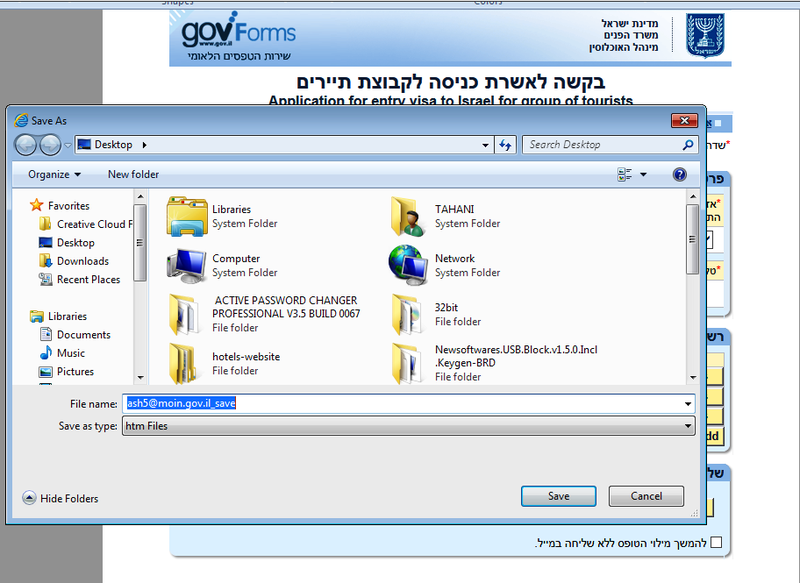 We would like to inform you that Israeli ministry of Interior activate a new online system for applying visa which will be effective from 01st Aug 2015. This system will help you to save your client’s data and modify them online, if any, and you will send us the final after finalizing the full data 35 days before for Muslim Groups and 15 Days before for Christian Groups from group arrival by email. In this system you will be able to insert the client’s passport details online and send it to us to complete the visa procedure submissions. You must have internet explorer 9, 10 or 11. Please follow the installation steps. Fill the client’s details name by name and then press add. Continue inserting the clients’ details. For relationship between clients, you will not be able to add a relation for the first name, so once you finalize inserting names you can go back to the first name and add his relationship with any other client, if any, from click hide details box which mentioned next to the last name in the list and (more details box) will be activated for the first name to make the amendments. after saving the file, please send it by email to our emails (Rami@os-tours.com), and must send us the email minimum 35 days before group arrival, enabling us to complete the visa procedures and submit it online, as it must be 30 days prior to arrival date for Muslim Groups and 15 days before for Christian Groups. Please note that no visa will be accepted for arrival less than 30 days as this application is online. 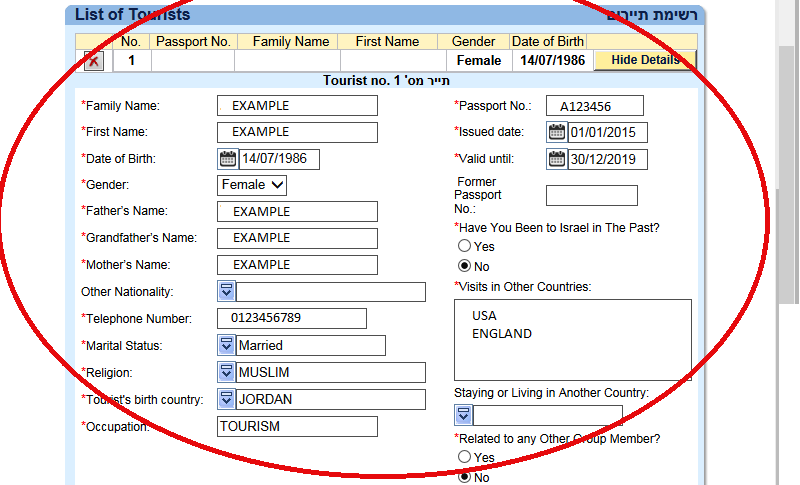 The system will not accept any passports validity less than 6 months from date of arrival to Israel. Please note that we can’t mix between two nationalities in this system, and for any we shall apply individually. We can apply individual visa for less than 10 pax only for Indonesian & Malaysian nationalities, Chinese clients need minimum 5 pax. We will be very glad to do an online presentation for you and your staff.